There is a strong link between overall health and oral health in humans. This is true for cats and dogs as well. This is partly true because the mouth is the intake organ for nutrients and hydrating water that the body cannot live without. There are specialized muscles to swallow and to chew which helps get the water and food into the body to be utilized. In order to break up the food sufficiently, teeth and lubrication (saliva) are utilized to create a bolus which is the method to get it safely into the stomach to be further broken down and absorbed (digested). 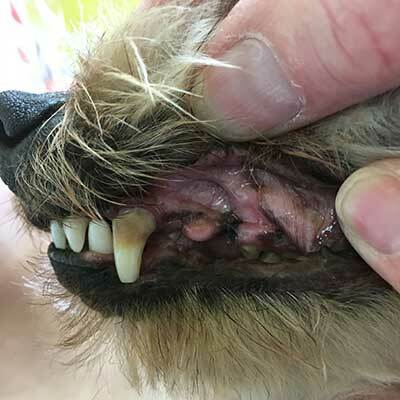 The mouth is an area to be taken care of both by the owner in the form of brushing and by the vet in the form of periodic dental exams and dental cleanings. In the home, it is recommended to brush your pet’s teeth. This mechanical action of cleaning helps remove both food and bacteria buildup which forms tartar. There are many “teeth cleaning” treats, foods, toys, and additives available for your pet, however, none of them are as good as simply brushing your pet’s teeth. If brushing at home is too infrequent or the pet doesn’t allow it, it can form a cement-type substance (calculus) which has to be removed using professional cleaning techniques at your veterinary hospital. Professional pet dental cleanings are very different from human dental cleanings and comparisons between the two often are inaccurately made. In the state of Oregon, anesthesia is required to do a proper dental cleaning that includes x-raying the teeth and their roots, examining the oral cavity, mapping the teeth and tooth condition, checking probing depths of the gums and cleaning and polishing all teeth. It is preparing for the procedure and the anesthesia that takes most of the day and most of the cost. At Astoria Animal Hospital, an initial consultation/exam is required before any dental work is done, in order to examine the animal for its need for dental work and anesthetic suitability. Also during this time we will provide you with the plan for the day and estimates of cost.